(MPI) – In the afternoon of December 19th 2017, at Binh Phuoc Province, Vietnam, the 11th meeting of the Join Coordination Committee on the Cambodia - Laos- Vietnam Development Triangle Area (CLV DTA JCC) took place under the co-chair of Mr Nguyen Chi Dung, Minister of Planning and Investment of Socialist Republic of Vietnam, Chairman of the JCC for Vietnam, Mr Pan Sorasak, Minister of Commerce of Cambodia Kingdom, Chairman of the JCC for Cambodia and Mr Souphanh Keomixay, Minister of Planning and Investment of Lao PDR, Chairman of the JCC for Laos. Speaking at the meeting, Minister of Planning and Investment of Vietnam Nguyen Chi Dung said that for more than a year, since the 9th CLV Summit was held on November 11th 2016 in Siem Reap, Cambodia and the 10th meeting of CLV DTA JCC in 2015 in Champasak, Lao PDR, with the efforts of the three CLV countries in building the DTA, significant results have been achieved in many areas, especially socio-economic development; hunger elimination, poverty reduction, security and political stability in the DTA. At the meeting, the Ministers appreciated the active participation of the ministries, agencies and local administrations in the CLV DTA in organized Trade and Tourism Fair on December 16th -18th 2017 at Dong Xoai commune, Binh Phuoc Province. The Ministers also encouraged CLV countries to hold similar events in the near future to enhance cooperation in the CLV business community as well as to share information, experiences and exchange trade and tourism between of the three countries. The Ministers welcomed the success of the Youth Forum on December 17th -18th 2017 with the active participation of youth delegations from the CLV countries. The meeting recognized the achievements of the CLV countries’ young generation and suggested that functional agencies of the three countries always pay attention to training young generation to promote the participation and contribution of young people to the overall development of the CLV DTA. The Ministers highly appreciated the results of the 11th Investment - Trade - Tourism Promotion Forum held on December 18th 2017 which attracted the active participation of 300 entrepreneurs and delegates in the CLV DTA. The forum was an opportunity for businesspeople to exchange experiences and seek opportunities to expand business development cooperation in and outside the region. The Ministers highly appreciated the ministries, relevant branch and local authorities actively participated in the events and activities on the sidelines of the conference to bring about successes of the JCC. They endorsed the recommendation of the Senior Officials’ Meeting (SOM) and expressed their satisfaction with the implementation of the revised Master Plan for Socio-Economic Development of the CLV DTA stage 2010-2020; the revised Memorandum of Understanding on the special preferential policy of the CLV DTA. The Ministers appreciated the contributions of development partners to the socio-economic development of the CLV DTA in the recent past. They suggested that the authorities of the three countries continue to hold conferences with development partners to call for financial support for priority projects in the region. The Ministers emphasized the importance of enhancing the cooperation among CLV countries in matters of security, foreign affairs, economics, trade, investment, agriculture, tourism, culture, education, science and technology, environment, telecommunications, information and communication technology,… to promote peace, security, stability and sustainable development of the region. The Ministers agreed that the three sides should develop an Action Plan for the implementation of the Socio-Economic Development Master Plan in the CLV DTA stage 2010 – 2020. 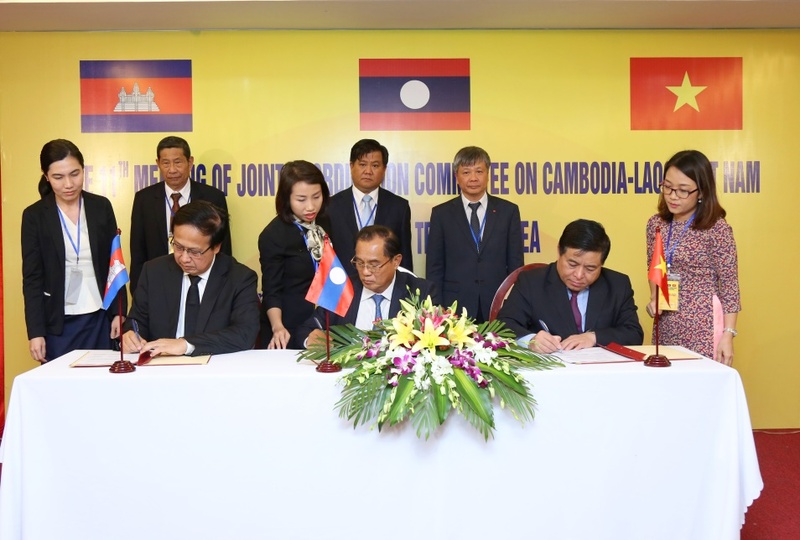 They also suggested Cambodia to speed up the completion of internal procedures to implement the Trade Promotion and Facilitation Agreement in the CLV DTA and proposed the three sides to coordinate to build Implementation Plan. The Ministers recognized that the working group of the three countries reached consensus on two-thirds contents of the draft Action Plan on CLV Economic Connectivity up to 2030, assigned the working group to further discussion and completion on January 2018 to submit to the 10th CLV Summit expected to hold in March 2018 in Vietnam. The meeting also recognized the importance of CLV Development Triangle Portal which has worked well for the promotion of investment, and proposed the management groups of this Website to solve problems in information publishing. Simultaneously, asked the ministries, branches and localities of the three countries provide and update information regularly. The meeting welcomed the Kingdom of Cambodia that is the host country to hold the 12th meeting of the Join Coordination Committee, Senior Officials’ Meeting and Subcommittees Meeting in the year 2019./.